This is the story of Sven Allard & Karl Karlsson. 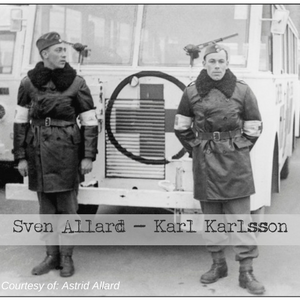 Sven Allard and Karl Karlsson were two young adventurous Swedish men who volunteered on a somewhat secret mission. They met in March of 1945 when Folke Bernadotte brought all of the volunteers together. In 1943, Sven Allard started working at The Royal Military Anti-Aircraft Corps in Malmo. During his time there, he worked at another military regiment in Hassleholm about 55 miles north east from Malmo. At this regiment in 1945, Captain Persson informed Sven about a secret mission into Germany to rescue prisoners. The captain thought Sven would be a good fit for the job. Sven was very interested in getting involved. Sven drove bus #27 during the whole rescue action, first with Karl and then alone when Karl became a motorcycle driver. After May 1st, 1945, Sven continued his regular work at The Royal Military Anti-Aircraft Corps in Malmo until Dec 31st, 1945. Later on, he worked for the Swedish Red Cross and the Swedish section of the international organization Save the Children. At the time when Folke Bernadotte was looking for volunteers, Karl Karlsson was un-employed. Karl was eager to help people in need while making a living. He was supposed to drive one of the 36 buses, but after the first rescue, he couldn’t stomach the sight of the Holocaust victims. Many of them were malnourished, sick, and covered in bugs. Karl was transferred to the motorcycle crew and led the buses through the nights. Karl didn’t share his experience until the 1980’s when he talked about it with his children. Through the story of Sven and Karl, we learn that a huge difference could be made when people come together as a team and take action.